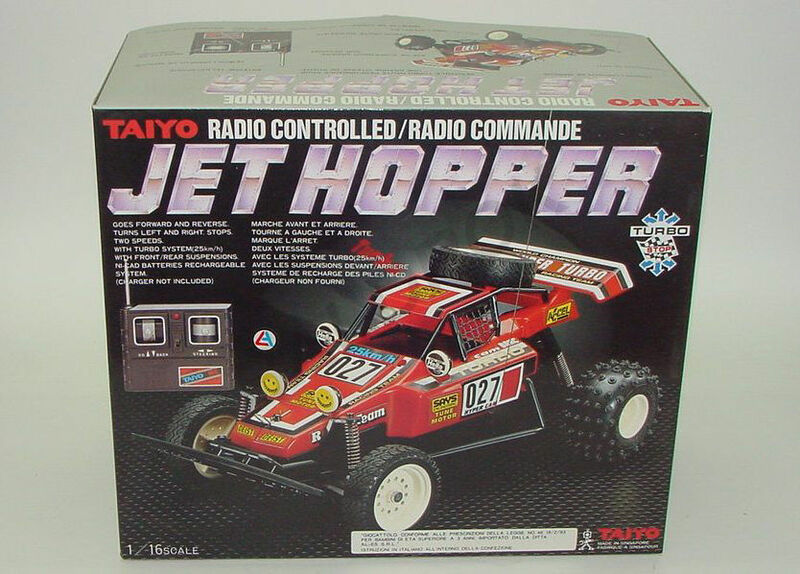 The original Taiyo Jet Hopper from Japan was a game-changing ready-to-run R/C toy that sold worldwide, and in the millions. 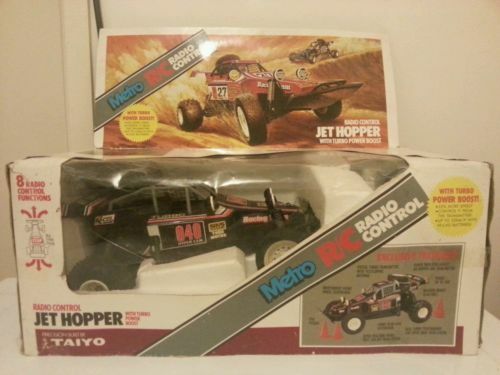 It was a huge hit for Taiyo, and was possibly the most popular R/C car of the 1980s across both toy and hobby grade models. There were also several changes to this popular buggy over the years, as Taiyo tweaked the suspension, tyres, decals and even the speed. Let’s go back to where it all began and take a look at the Taiyo Jet Hopper “Mk1” from Japan. 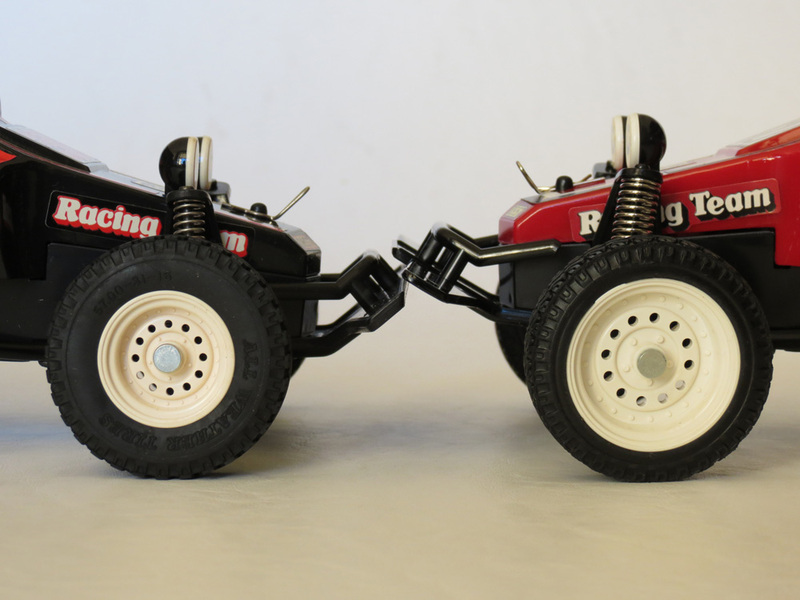 Between 1979 and 1985, hobby-grade R/C companies had shown that when it came to electric R/C vehicles there was a huge worldwide market for cars capable of running off-road. 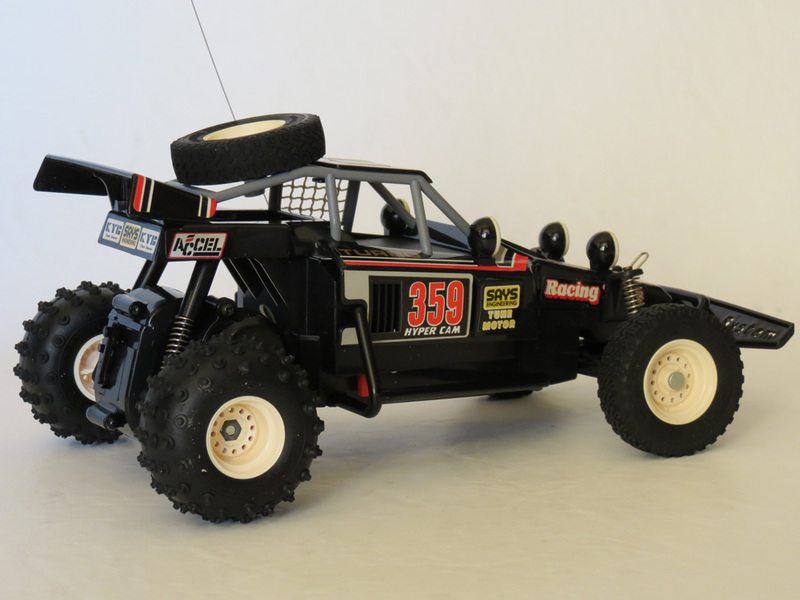 As each year went by, these models became more and more popular – particularly those from Japanese company Tamiya, who specialized in agile and fun off-road buggies. 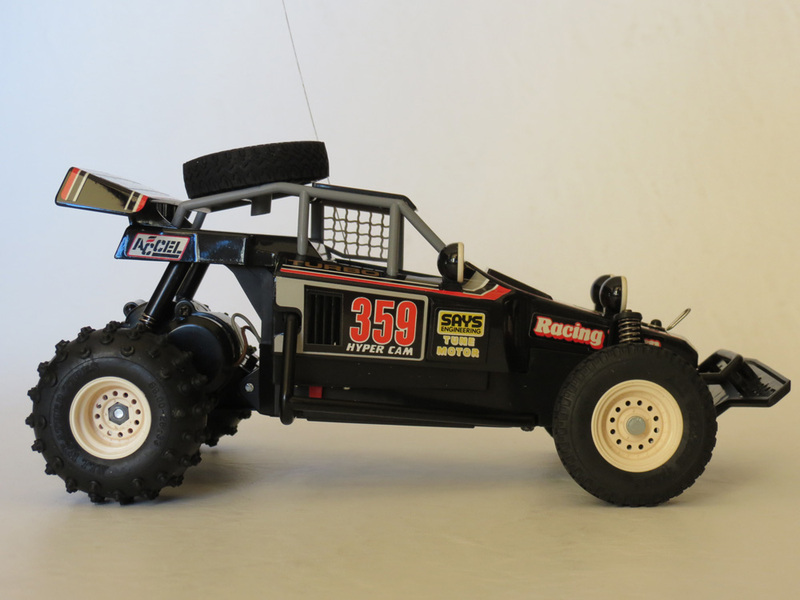 And with an explosion in the popularity of organized racing, off-road electric R/C cars were a huge market supported by many brands. Mk2 – Difference: Same as Mk1, except: top speed 25km/h (instead of 23km/h), low profile front tyres, LED “on” light added to car, several decal changes, longer travel front suspension. Mk3 – Difference: Same as Mk2, except: top speed 27km/h (instead of 25km/h), steering operates without the need to be going forward or reverse, changed decals, block pattern front tyres, pin spike rear tyres, and a changed front bumper. Tyco/Taiyo Turbo Hopper (USA). Packaged and branded by Tyco for US market. It came in two variants of it’s own. Dickie/Taiyo Jet Hopper (Germany). Packaged and branded by Dickie for German market. It came in at least two variants of it’s own. Metro/Taiyo Jet Hopper (Australia). Packaged and branded by Metro for Australian market. It came in two variants of it’s own. Taiyo Jet Hopper (Europe). European release with Taiyo branded black box (like Japan), except it has French text instead of Japanese text. It came in variants of it’s own. But at the cheaper, toy end of the market, most vehicles were still either on-road racing cars or vehicles with light off-road ability and minimal (if any) suspension. 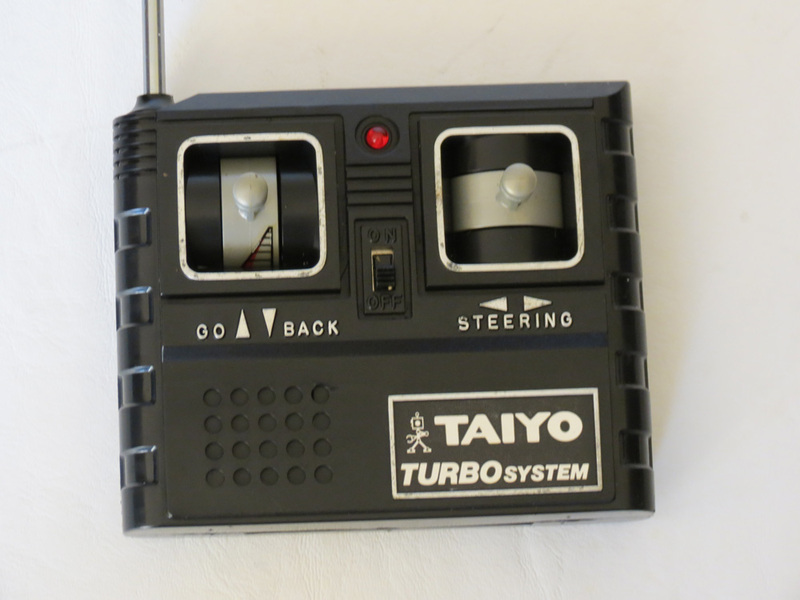 Enter Taiyo, a company that had been producing quite small but often nice-quality R/C toys since 1975. 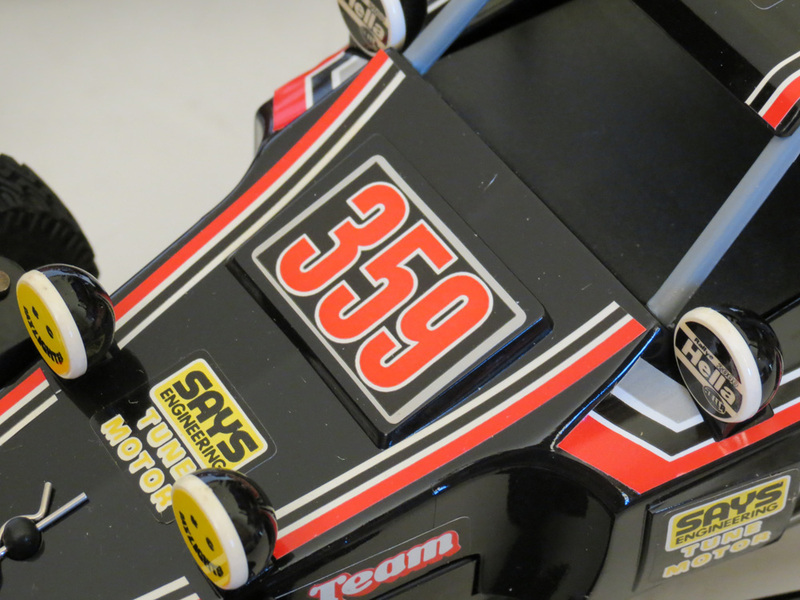 By copying the template of a basic but successful Tamiya buggy and pinching the use of the word “Hopper” (which Tamiya had first invented for use on their massively popular, insect-inspired “Grasshopper” 1/10 scale R/C buggy) but making everything smaller and cheaper (1/16 scale), and without the need for hours of assembly… Taiyo landed on one of the true hit toys of the decade – the Jet Hopper. First released in Japan in 1986, the model was later revised, as well as being adjusted for release in many other countries where it was rebranded. 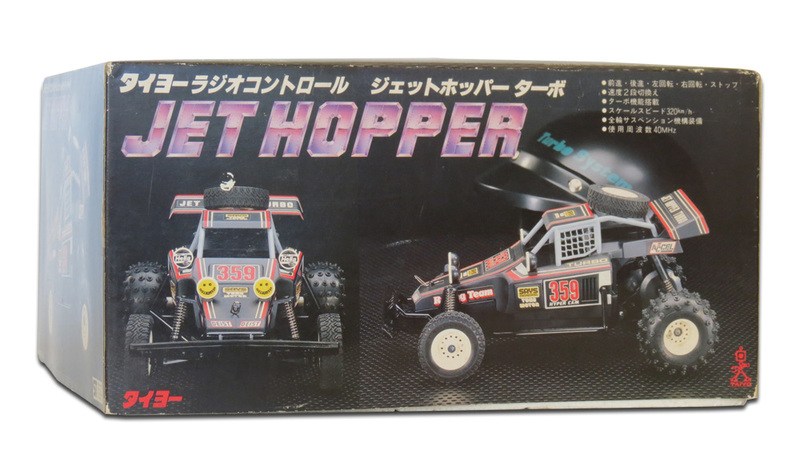 On this page, I’m going to talk mainly about the Taiyo Jet Hopper Mk1, Mk2 and even Mk3 – the original Jet Hoppers from Japan. I’ll compare a couple of them together to show how the toy changed from what call “Mk1” to “Mk2′. 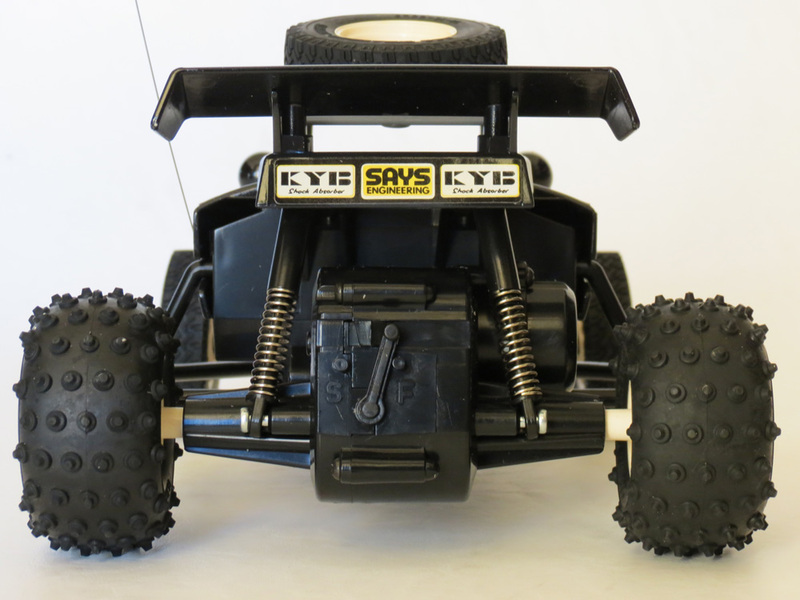 And I’ll also compare the Mk1 to the US version known as the Tyco/Taiyo Turbo Hopper. The main example shown on this page is a brand new, black Taiyo Jet Hopper Mk1 as sold in Japan. “Mk1” means “Mark 1”, as in, this is the very first variant of this model ever released in the world. 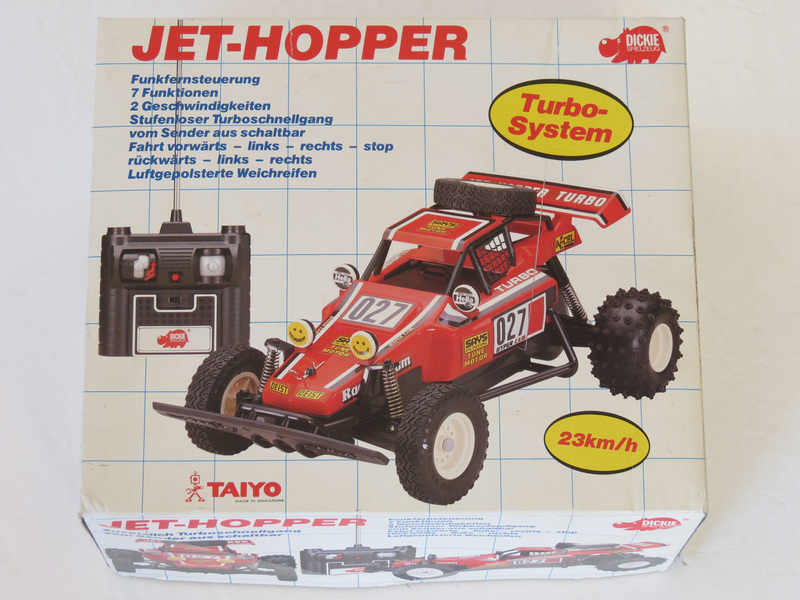 Whenever the car was sold purely under original Taiyo branding as the “Taiyo Jet Hopper”, it came in a lovely black box with a large photo on the front (plus a racing helmet in the background) showing whichever version of the car was inside. 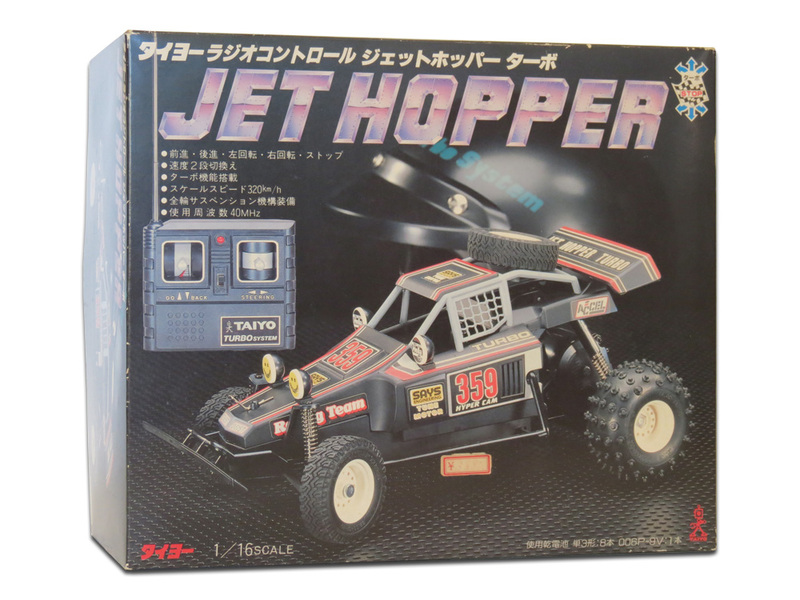 The Jet Hopper was the first of a series of Taiyo models to be released in these stylish black boxes with large photos, throughout the mid-to-late 1980s. – Front tyres are taller and fatter. – Front suspension is shorter. – No LED light on the bonnet. 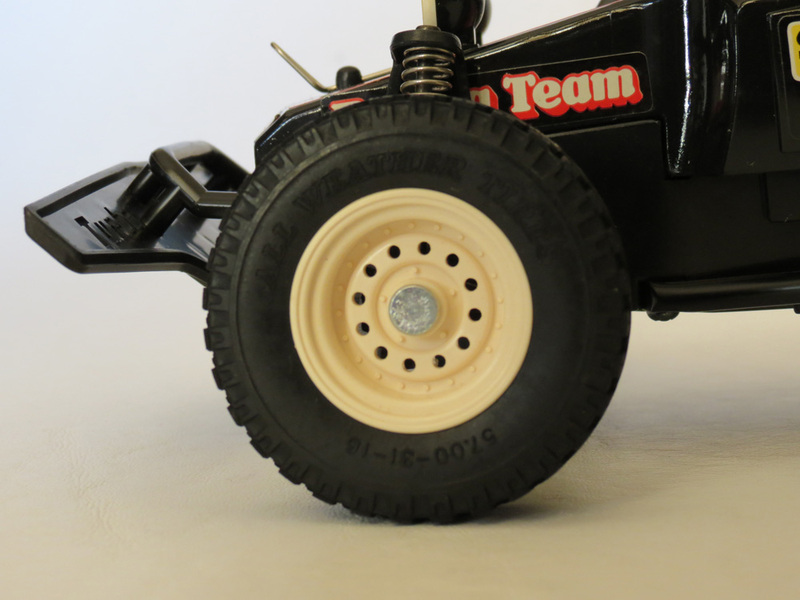 Taiyo later changed the front tyres to be thinner – and that is what you find on the Taiyo Jet Hopper Mk2, the Tyco/Taiyo Turbo Hopper, and many other examples of these buggies found around the world. Here is a close-up photo showing the front tyre – it has a tall side-wall and also has the words “All Weather Tyres” written on the side, the same as the rear tyres. Another notable feature is that the Taiyo Jet Hopper Mk1 has a smaller (less wide) front bumper, with the words “Turbo System” cut out of it. 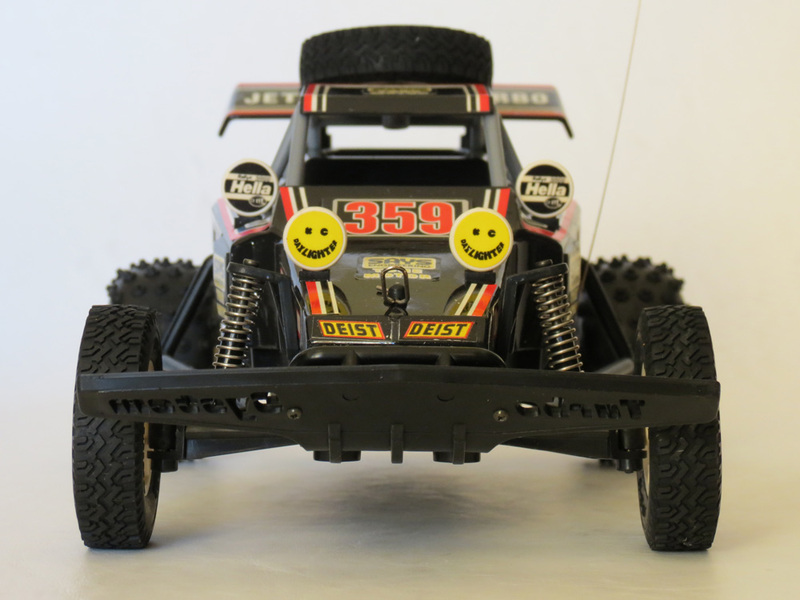 This bumper also appeared on the Taiyo Jet Hopper Mk2. 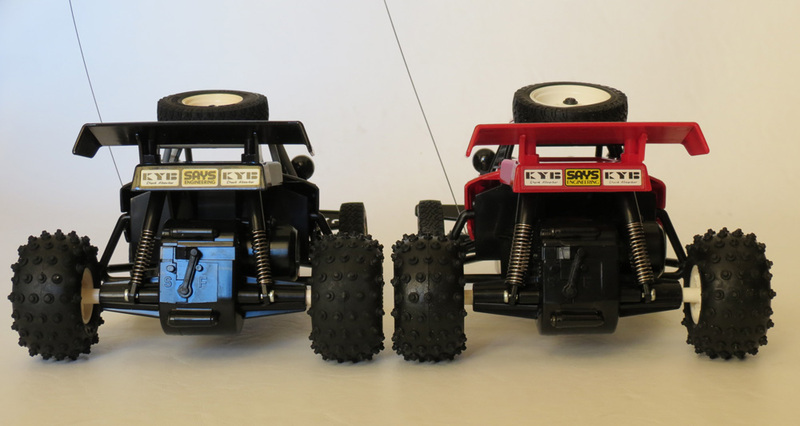 However, the Taiyo Jet Hopper Mk3, and the Tyco/Taiyo Turbo Hopper, and most others, all have a larger (wider) bumper with no writing at all. 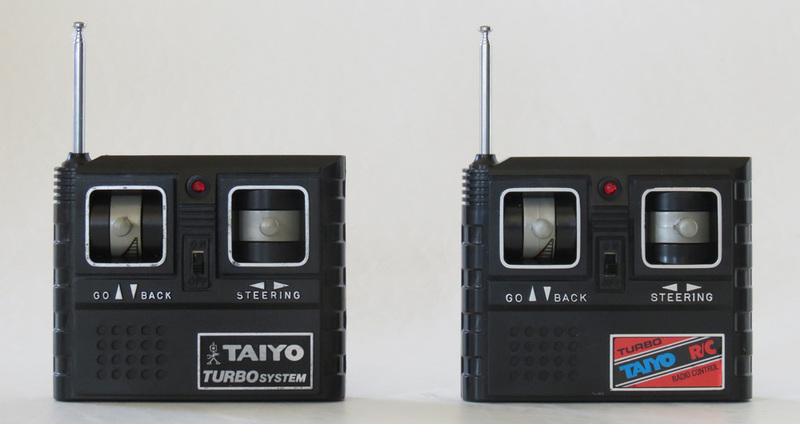 Here are some photos comparing the Taiyo Jet Hopper Mk1 (left) and the Taiyo Jet Hopper Mk2 (right). 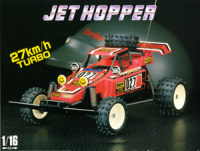 Taiyo revised the Jet Hopper in a number of areas, and also changed the box photo. Now let’s look at the two buggies side by side. The Mk1 is on the left, and the Mk2 is on the right. – The decals are different between Mk1 and Mk2. – The Mk1 has taller and fatter tyres, while the Mk2 has low profile front tyres. – The Mk1 has shorter front suspension travel than the Mk2. – The Mk1 has no LED light on the bonnet, while the Mk2 does. From behind, we can see that the Taiyo Jet Hopper Mk1 and Mk2 are actually identical in terms of gearbox and rear suspension. 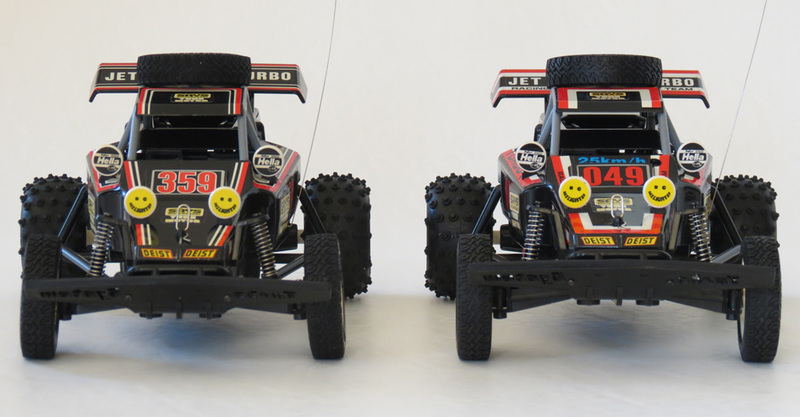 Here are some photos comparing the Taiyo Jet Hopper Mk1 (left) and the popular Tyco/Taiyo Turbo Hopper (right) as it was first sold in the USA. 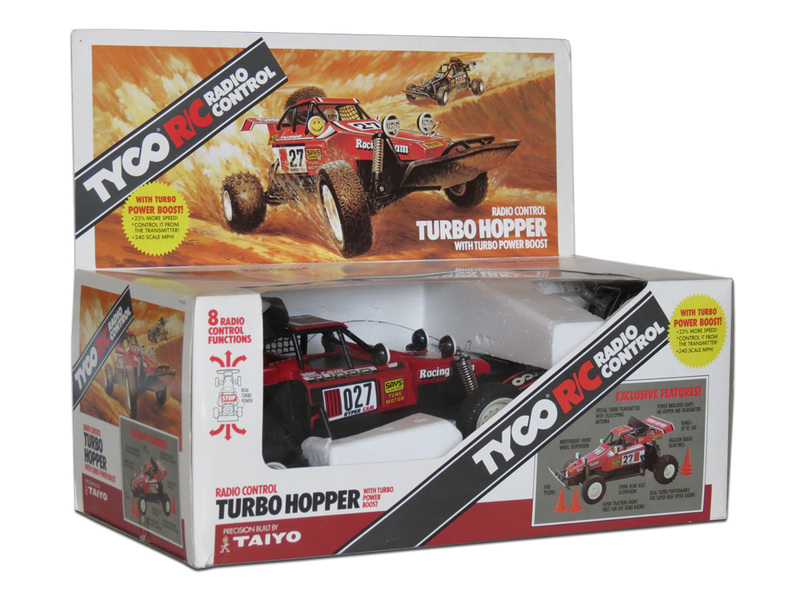 The Tyco/Taiyo Turbo Hopper shown here is, itself, a “Mk1” among Tyco/Taiyo Turbo Hoppers. 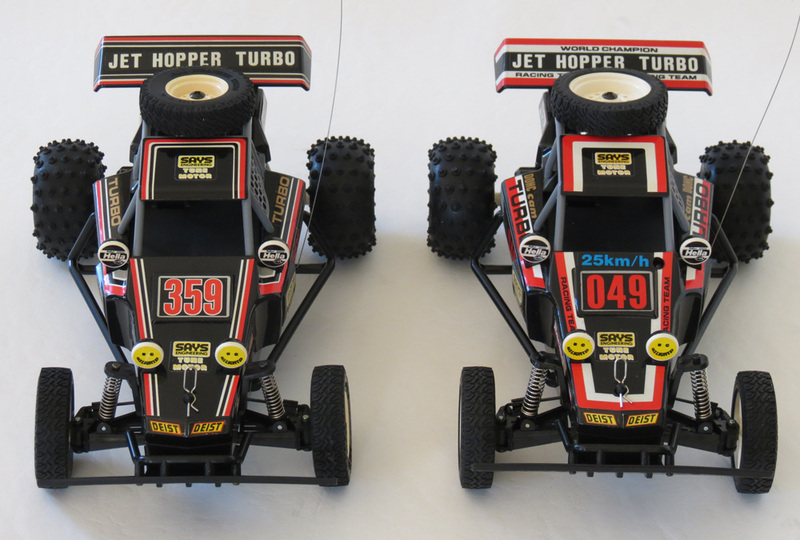 Overall, you can say that the Tyco/Taiyo Turbo Hopper Mk1 was similar to the Taiyo Jet Hopper Mk2. But! Even they are not the same. 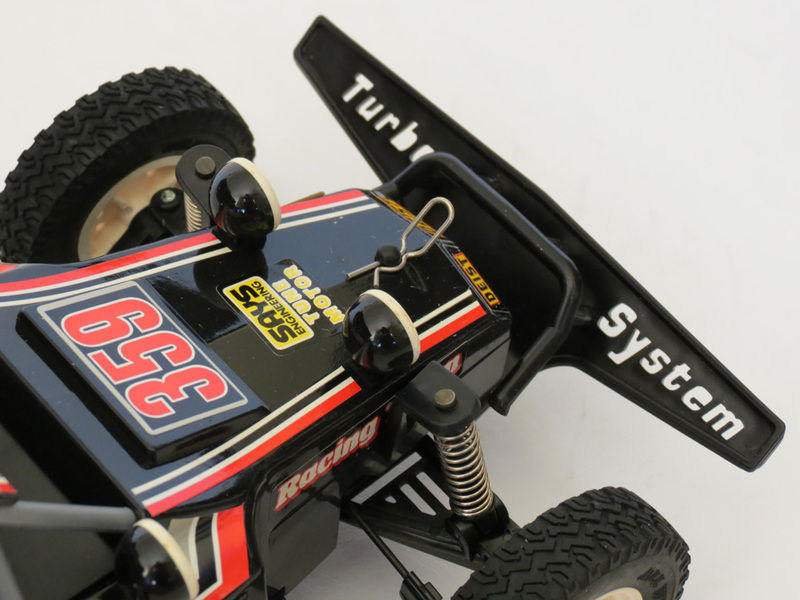 And of course, the Tyco/Taiyo Turbo Hopper Mk1 also differs in the area of decals, because it has “Turbo Hopper” on the rear wing, among other things. To see more photos of the Tyco/Taiyo Turbo Hopper, visit the full article. The Taiyo Jet Hopper Mk3 differed yet again. It had a different box image, and it’s advertised top speed was 27km/h, as opposed to 25km/h for earlier models (plus a decal on the car was also changed to reflect this). In my experience, the Mk3 is notably quick – but I have not yet confirmed it’s speed over the Mk1 and Mk2. The Mk3 also had entirely different tyres to the Mk1 and Mk2, with low-profile block pattern front tyres and low-profile spike pattern rear tyres. The front bumper was also changed. 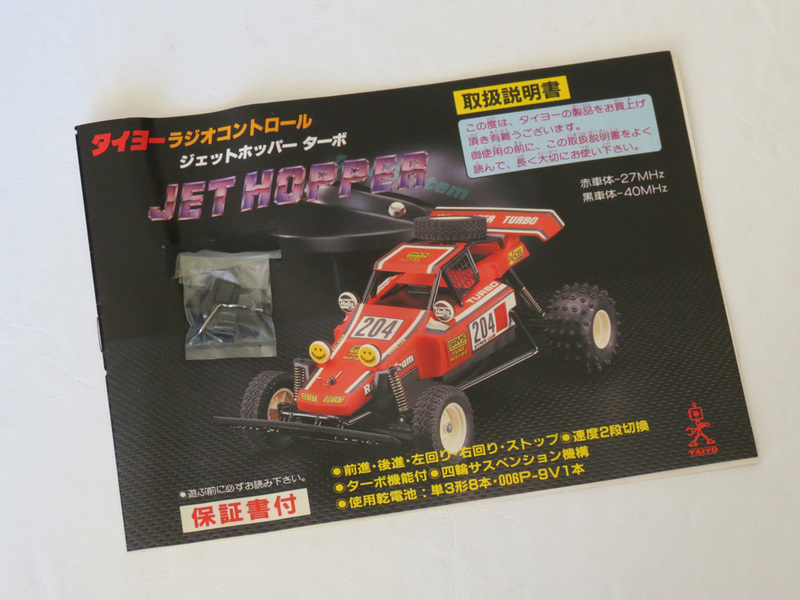 For an example of how it looked, here is a Taiyo Jet Hopper Mk3 that I sold a while ago (it was missing one bonnet decal, but was otherwise a decent example complete with the box). 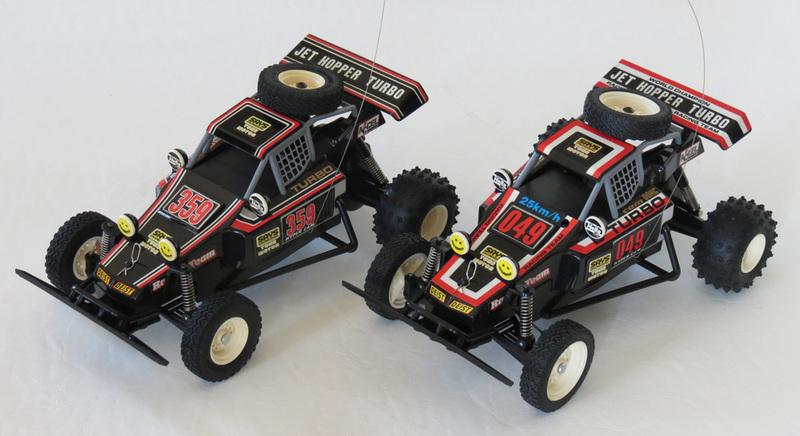 The Taiyo Jet Hopper Mk1 is where it all began for this series of buggies, and was the beginning of a hugely successful R/C buggy series for Taiyo. The Mk1 is also very rare, and the one featured here is one of the only new in box examples I have ever come across. 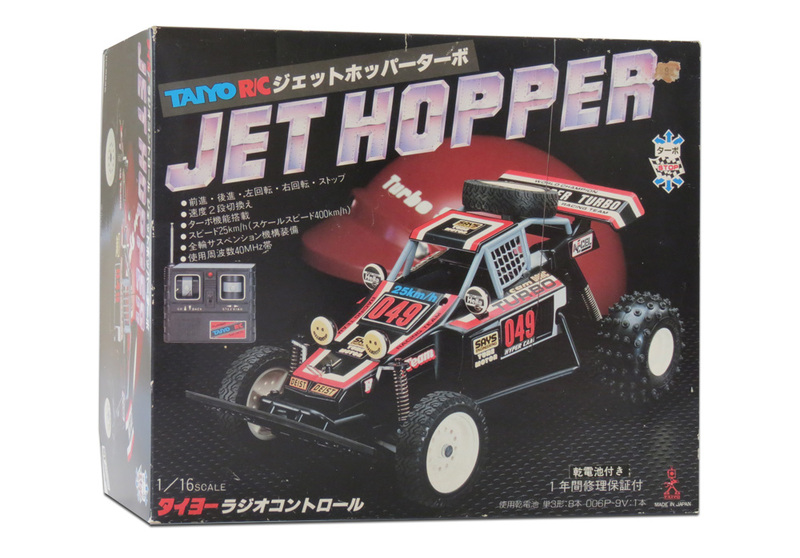 So hopefully that gives you a good breakdown of the history of the legendary Taiyo Jet Hopper, which was a very popular toy in places like Japan and Europe, before it’s popularity was extended even further under Tyco/Taiyo branding in the USA. 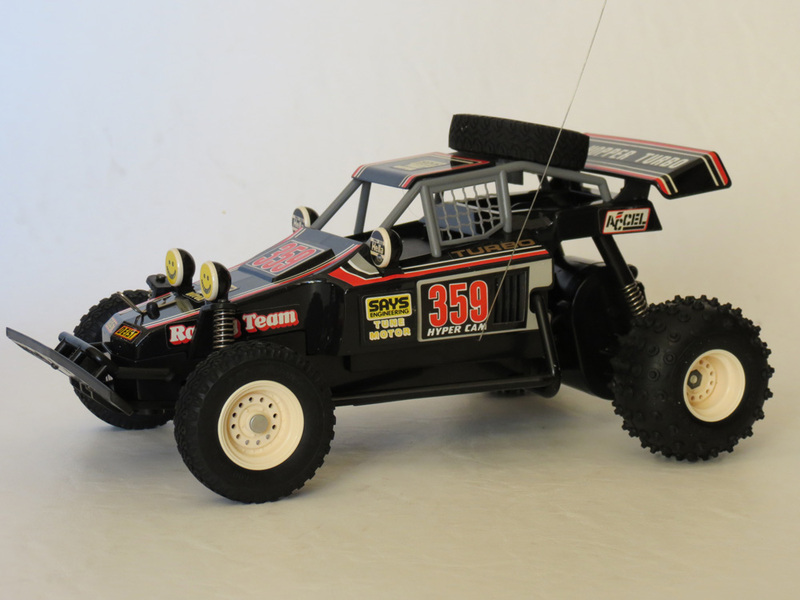 The idea of a realistic, affordable, and relatively fast little R/C buggy was simply the perfect product, released at exactly the right time. I can still remember hearing kids in the school playground talk about how cool it was that this car had “a spare tyre on the roof” as well. 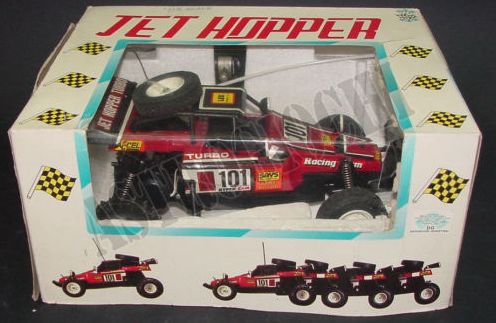 Today, Jet Hoppers are one of the most collectible vintage ready-to-run R/C toys of the 1980s – even examples that don’t work at all are worth something to collectors, looking to restore their models. The very few brand new in box examples that still survive are considered true collector’s items and usually fetch many hundreds of dollars (I have even seen one fetch over $1000 in Australia). 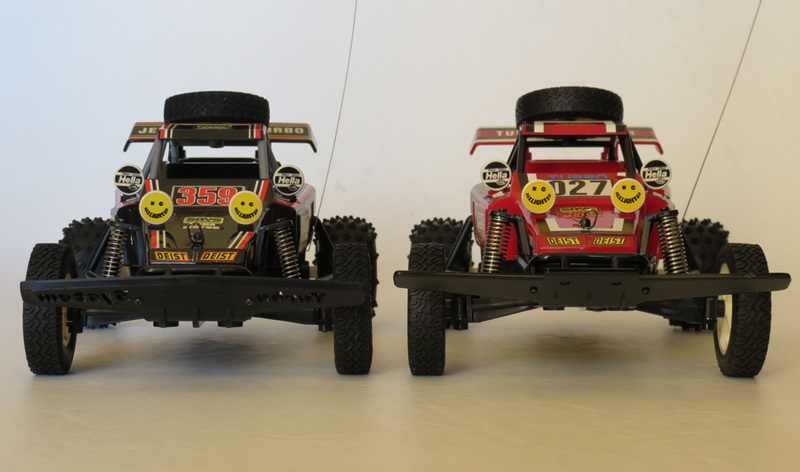 In some cases, they are more valuable than some vintage Tamiya R/C buggy kits. So if you still have your Jet Hopper, you might consider cleaning it up and putting it on the shelf sometime. It was a truly quintessential 80s toy, and still looks impressive and unique when on display. Thanks to it’s speed, versatility and immense play-value, most examples of this model were run pretty hard. This means most surviving examples today have a fair amount of wear and tear. Here are the main things to look out for when collecting this model. Front steering rod clips are often broken. Knowing this was a weak point, a spare set was provided in the box. Front bumper is often cracked or snapped off. The transmitter is prone to internal build up of dirt on the contact points, but it is generally quite robust and will work again after being disassembled and cleaned carefully. Decals are often worn in certain areas, particularly the rear wing. That’s actually a fake 🙂 It’s a “Lex Jet Hopper”, and that is a fake clone not made by Taiyo. These have been sold under several names, isn’t this car the same as a Taiyo jet hopper but just with another name of brand? No, because every genuine Jet Hopper sold under other brand names (like Tyco, Metro or Dickie) always still has “Taiyo” on the box because it was made by Taiyo. But the Lex model does not have Taiyo on it. You can see another pic of it here where another person has a Lex model. I think the later branded Hoppers have their front tyres labelled “Type B”, and assuming the earlier originals might be “Type A”. In Australia it was marked Metro Jet Hopper. I had a black one and my brother a red one. I think the black was 40mhz and the red was 27mhz so they would worth together. Loved this car. Totally correct Nidz, thanks for the comment! Edit – I have since dedicated a page to the Metro/Taiyo release as well. Great site, the toy that made my child hood. Should totally be remade would sell millions. Bit of a collecter got about 8, 2 in boxes one brand new never used. Still has the 1986 Christmas morning smell about it. Just a ad on for your site is that they made the tyco wild thing in the 90s same car just re stickered with brighter colours. P.s. Any one making parts? Cheers Grant. Sorry for the late reply. Sounds like you have a great collection going there, especially with the brand new one. I also remember the Wild Thing, yes, which was pretty much the same buggy… might have to classify it as a different model though since it had a different name/look (rather than as a variant of just the plain Jet Hopper). As for parts – no, there are no parts for it really, only what you can find by using other old cars, or the very few NIP parts from the 80s that are still floating around. What are the true size version of them called? I saw a show on them racing in the desert? I have a red Jethopper Turbo and i think its MK1. Is it possible to find new lights ? Three of them is missing. Exept that its in mint condition. Hi Johan – it is possible to find them. In fact, I bought some recently. But the only ones you will find are used ones, taken from other cars. The lights were never sold as separate spare parts. Not as popular or well known as the Turbo/Jet Hoppers, but it looks pretty much the same chassis/body/functions, so I’m sure someone would like to own it. I had a the american “heads up” turbo hopper as a kid. I distinctly remember it not having differentials in the back. But I just picked one up now that’s pretty mint and it does have differentials (surprised the hell outta me). Were there any other variants of this car that had differentials? I didn’t think there was? Hey Cubby – the only Heads Up Hoppers that I have had, have all had differentials. And I’m not aware of any variant that didn’t. Heads Up Hopper of course came out later, and used a newer chassis than the original Jet Hoppers/Turbo Hoppers (none of which had a differential). So it makes sense that a diff would be added – as the original Jet Hoppers experienced a lot of wear to the rear tyres without it.